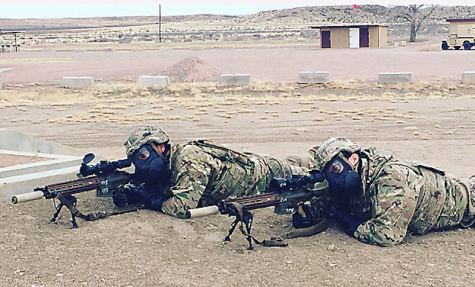 FORT CARSON, Colo. --- Eight Ivy Division snipers with the 2nd Infantry Brigade Combat Team field tested an upgrade to the Army's sniper rifle in the shadows of the fabled Rocky Mountains. Engineered as an upgrade to the M110 Semi-Automatic Sniper System, the Compact, Semi-Automatic Sniper Rifle (CSASS) was redesigned to enhance a Sniper's capability to perform missions with greater lethality and survivability, according to Maj. Mindy Brown, CSASS test officer with the Fort Hood, Texas-based U.S. Army Operational test Command. Upgrades being tested include increased accuracy, plus other ergonomic features like reduced weight and operations with or without a suppressor. Brown said the purpose of the operational test is to collect performance data and Soldier feedback to inform the Army's procurement decision regarding the rifle. "We do this by having the Snipers employ the system in the manner and the environment they would in combat," Brown said. "In doing this, we achieve a twofold benefit for the Army as we test modernization efforts while simultaneously building unit -- or in this case -- Sniper readiness." She went on to explain how the 2nd IBCT snipers stressed the rifles as only operators can, during the 10-day record test. The Snipers fired 8,000 rounds from various positions while wearing individual protective and tactical equipment as well as their Ghillie suits and cold weather gear. To also test how the CSASS allowed Snipers to shoot, move, and communicate in a realistic combat environment, they also executed Situational Training Exercise (STX) force-on-force missions in what they described as, "the best Sniper training they'd received since attending Sniper School at Fort Benning, Ga."
The 2nd IBCT Snipers really pushed each other, testing the CSASS in what evolved into a competitive environment on the ranges. "Despite single-digit frigid temperatures, gusting winds, and wet snow, the Snipers really impressed me with their levels of motivation and competitive drive to outshoot each other," said Sgt. 1st Class Isidro Pardo, CSASS Test Team NCOIC with OTC's Maneuver Test Directorate. An agreed upon highlight of the test among the Snipers was the force-on-force day and night STX Lanes. Sniper teams were pitted against one another on tactical lanes in natural environmental and Urban Terrain to see who could infiltrate, detect, and engage whom first. Staff Sgt. Cameron Canales, from Bravo Company, 1st Battalion, 12th Infantry Regiment said, "The force-on-force STX lanes were an extremely fantastic way for us as Snipers to hone our field craft." One other Sniper, Sgt. 1st Class Cecil Sherwood, from Headquarters Troop, 3rd Squadron, 61st Cavalry Regiment said he really enjoyed all the "trigger time" with the CSASS. Sherwood said he was able to learn from the other test Snipers and improve his field craft. "In a regular Sniper Section, I would never get this much trigger time with a Sniper rifle or be issued nearly as much ammunition to train with in a fiscal year, let alone a 10-day period," he said. While OTC celebrates its 50th Anniversary, 2nd IBCT Snipers and OTC's CSASS Test Team are a testament to the importance of the half century relationship between the Operational Force and the test community. "As we move into a period of focused modernization, now, more than ever, that relationship is decisive to ensuring only the best materiel capability solutions make it into the hands of the men and women in uniform serving on the front lines around the world and at home," Brown said. Operational testing began Oct. 1, 1969, and as the Army's only independent operational tester, OTC is celebrating "50 Years of Operational Testing." The unit taps the "Total Army" (Active, National Guard, and Reserve) when testing Army, joint, and multi-service warfighting systems in realistic operational environments, using typical Soldiers to determine whether the systems are effective, suitable, and survivable. OTC is required by public law to test major systems before they are fielded to its ultimate customer -- the American Soldier. The Maneuver Test Directorate based at Fort Hood, Texas, conducts independent operational testing of infantry, armor, and robotic systems to inform acquisition and fielding decisions for the Army and select joint Warfighting systems. Poised, ready, and always able, the MTD has and will remain the "go to" test directorate to provide the Army Futures Command and senior U.S. Army Leadership with the truthful test feedback required to make informed decisions as to what capabilities will be brought to bear against future adversaries.